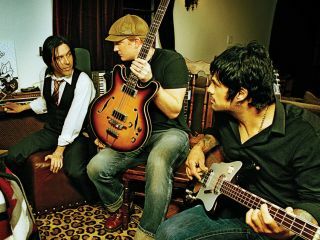 Queens Of The Stone Age frontman Josh Homme wants to ship the band out to his desert studio to record album number six. Homme wants the follow-up to 2007's Era Vulgaris to be "like a fireball". Josh spoke to NME about future plans: "We may move out there for a few months. That way, you build up anxiety and desperateness to record so that, when you do, it's like a fireball." The band are no strangers to scorching sands and desolation. The Josh Homme-founded Desert Sessions is an irregular event in which a bunch of talented musicians disappear into the desert to make music. Previous intrepid contributors include PJ Harvey, Eagles Of Death Metal, Kyuss and the rest of Homme's associated acts. Rumour has it that Arctic Monkeys might drop in for the next session. QOTSA are currently remastering 1998's self-titled debut album for a 10 November release. Metallica might want to take note.